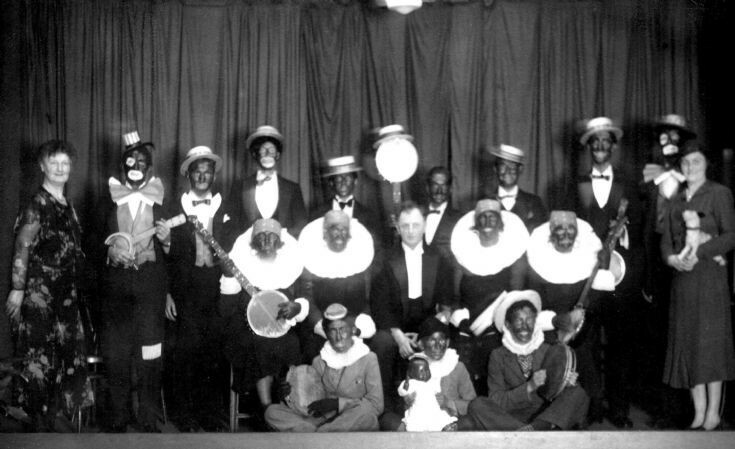 At the end of the 1930s, Bill and Bert Robinson (see picture #438) formed the Handcross Minstrels, with Bert being the interlocutor; the minstrels equivalent of a Master of Ceremonies. The photograph shows the two pianists, Mrs Florence “Flossie” Shearlock on the left, and Mrs Bill Robinson on the right. Although they are named in the attached newspaper cuttings, I shall list the performers to assist anyone using the search facility. They comprised seven men, five ladies, and five boys as follows:- Miss Blaby, Mrs Clarke, Mrs J. A. Smith, Mrs R. D. Tulley, Mrs Doggett, Cornelius “Pat” O’Shea, W. Stevens, Roger Ray, H. Morley, W. G. Mitchell, Bill Robinson, W. Wood. The boys were Joe Colburn, Hubert Jakes, Pat Clarke, Philip Etherton, and Bernard Hooten. Pat O’Shea is standing at the back on the extreme left, with Roger Ray next to him. Due to the make-up, the others are difficult to recognise! The Large version shows a close up, although the clarity is not good. Click on Open Document for a newspaper cutting of the show from the Mid Sussex Times.